In a saner world, the terrorist ties and Islamist agenda of the Council on American-Islamic Relations (CAIR) would render it politically untouchable, with candidates for office shunning the organization and chastising those rare opponents who back it. Controversies from two ongoing election campaigns offer provocative hints that such a world may be closer to reality. I haven't met with them, nor will I. CAIR is the moral equivalent of the Ku Klux Klan. I wouldn't meet with them either. Hashmi, who was last seen at Islamist Watch parsing the free speech rights of apostates, replied by playing the bigotry card: "He touts this as a crusade against CAIR, but everybody knows it's anti-Muslim." Yawn. Second, CAIR has arisen as an issue in Pennsylvania's U.S. Senate race. 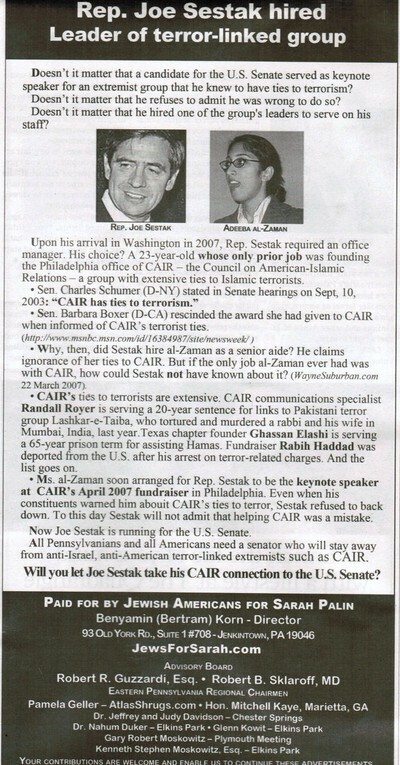 As Daniel Pipes chronicles, Democratic candidate Joe Sestak, currently a congressman, is being hammered for hiring a local CAIR leader as an aide and appearing at a 2007 Philadelphia fundraiser for the group. Senator Arlen Specter got the ball rolling months ago with a letter slamming his ultimately victorious primary opponent for having "gone out of his way to speak at a fundraising dinner" for CAIR. Next, the Emergency Committee for Israel started running a video ad against Sestak, stating that he "raised money for an anti-Israel organization the FBI called a front group for Hamas." The effort has escalated with an advertisement in the Philadelphia-area Jewish Exponent titled "Rep. Joe Sestak hired leader of terror-linked group." The congressman's response: demanding that Comcast no longer carry the Emergency Committee's TV spot and attempting to spin his role at the CAIR banquet. A number of public officials, including Democratic senators, have stepped forward to censure CAIR in recent years. However, the harsh criticism levied against it in 2010 political campaigns represents a new and welcome phenomenon that reflects the group's growing toxicity — and promises to increase it. After all, ads invoking the organization's radicalism and op-eds sparring over it in the Philadelphia Inquirer will help thousands of people learn about CAIR for the first time. And, more often than not, to know CAIR is to dislike it. Bad news for Islamists. Good news for America.